2 Bedrooms, Sleeps 3. At Foot Of South Downs National Park Near Brighton. This cosy cottage has a unique position. It is very close to the main street of Steyning with interesting independently run shops, pubs, restaurants and coffee shops. At the same time it is on the edge of the small town and you can be on a country footpath within 5 minutes of leaving the cottage. End of terrace, Victorian, Rosebud Cottage has been beautifully restored and is unusually light and bright. It is traditional but stylish. There is free wifi and unrestricted parking. Enjoy the bright, light living room with its comfortable seating. You'll find a flat screen TV, Blu Ray/DVD/CD player, board games and plenty of books on the local area. Make the most of the separate kitchen: It has all you could need with a small dining table, an oven, 4 ring gas hob, dishwasher, fridge, separate freezer, microwave and toaster! The cottage also has a washing machine and tumbler drier. Appreciate the colour scheme and furnishings in the main bedroom, which make it especially relaxing. There is a tiny original Victorian fireplace and lovely hand painted cabinets. The second bedroom has a single bed, with generous storage. If you visit in winter, you will find that the cottage is exceedingly warm and snug. The garden is a delight all year round - with lovely flowering climbers and perennials. There are benches both in front and behind the cottage, where you can sit and relax. I grew up in West Sussex by the sea. I loved Brighton and often visited Steyning - going there for lunch in a country pub with my parents. I was as a teacher for most of my working life - now I have retired and can devote my time to running Rosebud Cottage! 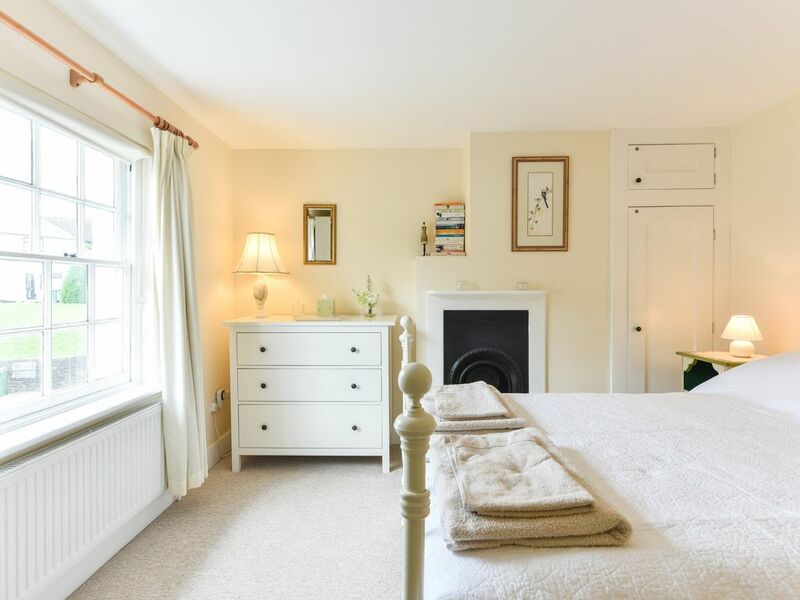 I chose a cottage in Steyning as it is a lovely picturesque place. I looked at property for 2 years before I chose Rosebud Cottage. It was perfect for me! I love the character of my cottage built in the 1850's. The position is perfect - on the edge of Steyning five minutes from country footpaths yet near local pubs, restaurants and shops. It couldn't be more convenient! I also choose it because I realised how friendly people were in the terrace - sit in the front garden and everyone says hello. However if you want more privacy you can relax in the back garden and listen to the mill stream which runs behind the garden. Steyning is at the foot of the South Downs National Park. There are country footpaths within minutes of the cottage. Steyning is picturesque with a wealth of historic buildings and a museum. There are tea houses, pubs, restaurants and interesting shops. Good quality bed linen is provided in both rooms. There is a washing machine you can use. There is a Bosch tumble drier you can use. Clothes can be dried on a washing line in the garden or on a drying rack in the cottage. There are two fireplaces but these are not currently in use. There is unrestricted parking in the street outside. You can also leave your car - day and night - in the car park of a quiet pub very close to the cottage. There is 24 hour free wifi. This is a cosy comfortable room with a sofa, easy chair and ottoman. A TV, DVD player and digital radio are provided. There are also books and games for you to use. A new Neff dishwasher has just been added! There is a separate fridge and freezer. There is a gas hob with four rings. There is an electric fan oven. There is a full range of good quality dishes and utensils for you to use. The dinner service is Royal Worcester bone china and there are some crystal glasses for you to enjoy! The kitchen is separate with a small dining table. It is very well equipped. There is a lovely bone china dinner service and some crystal glasses which you can use. There is a small dining table in the kitchen. It can seat 3. There is a booster seat which allows a dining chair to function as a child's highchair. There are a selection of DVDs which you can enjoy watching. There is a great collection of books on the local area. You will find books with suggested walks and local maps for walkers too. You will also have a selection of novels which you can read. There are playing cards and board games - in case you would like to stay in & relax. A teddy bear and small toy rabbit. There is a lawn in front of the house & a garden seat where you can relax. Say 'hello' to some of the neighbours! You can also sit out in the beautiful back garden & listen to the nearby stream! There is a paved seating area with garden benches where you can sit out and relax. It is surrounded by beautiful flowering plants. Rosebud Cottage is especially light and bright. Built in the 1850's it has been beautifully converted & is traditional yet stylish. It is especially well equipped and can provide an excellent base for guests who are keen to walk locally or to explore the south of England. A very clean, comfortable & well equipped cottage with lots of character. The owner has thought of everything you may need during your stay. Steyning is a lovely town with lots of lovely buildings, independent shops, tea rooms, restaurants & bars. Really enjoyed our week there. A bonus for us was that no pets & smoking were not allowed at the property. Also has a small garden with a stream at the bottom which is very pleasant to sit in. I do hope you will be able to stay again. All needs met and supplied. Very comfortable and would come again and would recommend it to others.thank you. Many thanks for your comments. I am so glad you liked the cottage and do hope you will be able to stay again in the future. Steyning is a lovely picturesque village with historic buildings and a small museum open throughout the year. The cottage is close to the High Street which has restaurants, pubs and independently run shops. There is also a leisure centre close by with a gym, classes and a swimming pool. The cottage is a fantastic base for walkers as you are at the foot of the beautiful South Downs. You can be on a country footpath within 5 minutes of leaving the cottage. Make sure you walk up to the former Iron Age hill fort Chanctonbury Ring, three miles away, where you will have fantastic views. The long distance footpath The South Downs Way is within a mile's distance, however you can also go on easier level walks. You can use the local maps, books and leaflets in the cottage to help you choose where to go. Sussex has many historic buildings open to the public. I recommend the fifteenth century St Mary's House in the next village Bramber. Don't miss the Elizabethan manor house and gardens at Parham around six miles away. One of my favourite small towns locally is Arundel, where you can go to a new museum, Arundel Castle, the Wildfowl and Wetland Centre and Swanbourne Park and Lake. If you would like a visit to the sea Shoreham Beach is a fifteen minute drive. Make sure you also take a trip to lively cosmopolitan Brighton where you can take a walk on the pier and go round the famous Royal Pavilion as well as enjoying the shops and restaurants! It is easy to reach London from the station at nearby Shoreham by Sea. Trains run twice an hour and take 1 hour 15 minutes. 2 days cost 65% of weekly rate; 3 days 75%; 4 days 80% Arrival time is after 4 p.m. departure time by 10 a.m.